I'm writing this from Utah. I am home for two weeks. I haven't visited for such an extended period in years. After Thanksgiving, my grocery store was selling cheap turkey. I bought a small bird. It was my first time cooking turkey. I was pleased with the results. 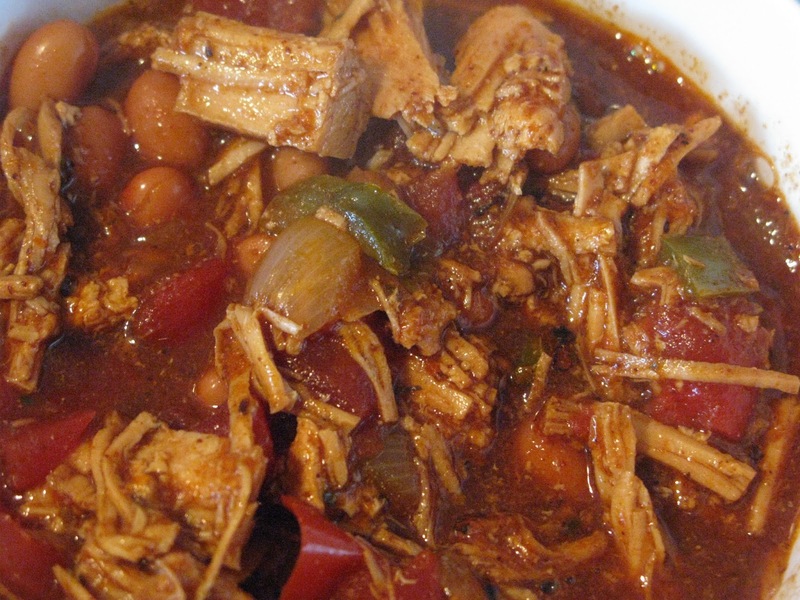 In addition to eating slices of turkey, I made this chili and a creamy soup I'll post later. 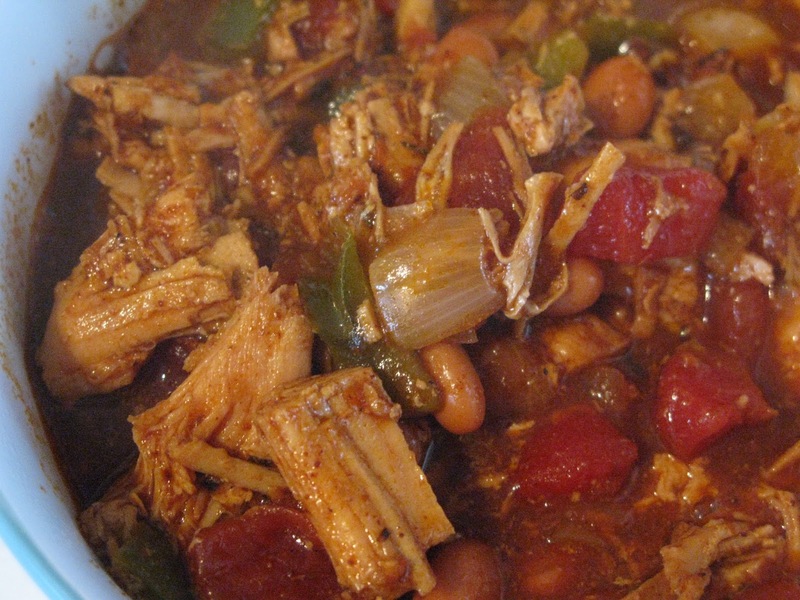 Chili is a perfect meal to make during the winter. It's hearty and nourishing. This is a great recipe because with Thanksgiving and Christmas, people often have leftover turkey. 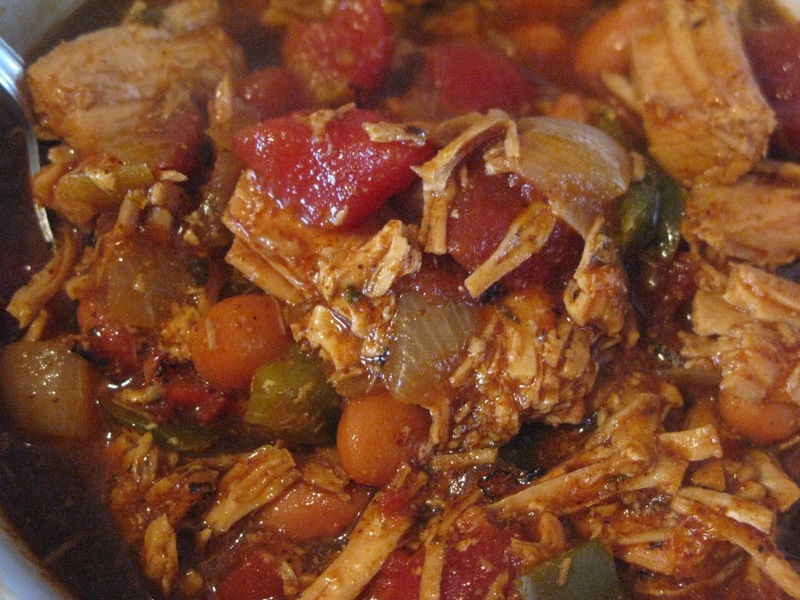 This turkey chile recipe came from the Food Network. I made it as directed, except for one minor change. They suggest you remove the seeds from the jalapeño, but I did not. The ingredients are 2 tablespoons vegetable oil, 1 medium onion, 1 green bell pepper, 1 small jalapeño, 2 minced garlic cloves, 1/4 cup chili powder, 1 tablespoon ground cumin, 1 tablespoon dried oregano, salt, pepper, 4 cups cooked turkey meat, 1 28-ounce can fire-roasted diced tomatoes, 2 cups chicken broth, and 2 15-ounce cans pinto beans. I added the oil in a large pot placed over medium heat. I added the diced onion and green bell pepper. I sautéed the onion and pepper for about six minutes. I added the jalapeño and garlic and sautéed the vegetables for another minutes or two. I added the chili powder, cumin, oregano, salt, and pepper. I added the turkey and stirred it until the turkey was coated with the spices. I stirred in the chicken broth and tomatoes. My broth was a little lump because I used the pan drippings from cooking the turkey. I let the chili simmer for 50 minutes over medium heat. I stirred regularly. After 50 minutes, I drained and rinsed on can of beans. I added it to the chile. I added the second can with all its liquids. I cooked the chile for another ten minutes to warm up the beans. It was ready to be consumed. It was a yummy, hearty meal. It was filling with large chunks of turkey. There was an abundance of smooth beans and sweet tomatoes. The chile was smokey from the fire-roasted tomatoes and cumin. It was spicy from the jalapeño and chile powder. It was rich and flavorful. I enjoyed this chile and would make it again. It was satisfying and comforting. Enjoy your time at home! This chili sounds wonderful! Thanks Ashley! Have a good Christmas!